Why can we grow black walnuts better than the Americans? 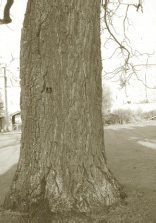 In our 2006 journal we began this debate and featured a fine black walnut growing in the Cambridge University botanic gardens. This year we feature two very similar trees in equally historic locations. Diameter at breast height: 128m (39.6 inches quarter girth, or 158 inches circumference). We have been unable to find records of the exact planting date of this tree - some say it was 1905 - but since it is almost identical in size as the Oxford tree, then 1850 is surely more likely? In the writer’s opinion, black walnuts growing in England appear to survive far longer than the common walnut (Juglans Regia). Alan Mitchell, the late renowned tree expert, recorded outstanding black walnut specimens, many of which still survive today. If readers can submit photographs and specifications of some of these wonderful old trees, then we will be happy to publish them each year. Charles (right) seeks divine inspiration! Charles has planted thousands of common, black and hybrid walnuts in the wonderful undulating landscape of his Château near Lisieux in Normandy. He has done more than anyone to spread the knowledge and science of growing trees and has inspired a generation of french walnut enthusiasts. 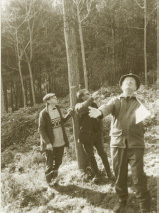 Several Woodland Heritage members were fortunate to visit Charles’ estate in 1995 – together with the East Anglian division of the Royal Forestry Society. We owe a huge debt of thanks to charles for his hospitality, kindness and willingness to impart his vast knowledge of walnut silviculture. The Somerset levels provide perfect soils and drainage for growing walnut. Renowned fruit grower, Edward Clifton-Brown (below), recently decided to plant up selected corners of his productive land with hybrid walnut with timber production in mind. Taking advice from Gabriel Hemery, Karen Russell and Alan Olley (all partners of the walnut company) about site selection, spacing and management, he has designed his own deer guards which also have vole protection and mulch matting. Edward is delighted with progress of his walnuts after just one year.